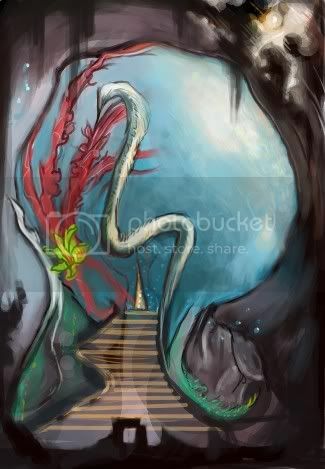 ConceptartCohesion #001: 8th Day >>> EOW - Mystical Cavern Temple ProNatura - Voting! 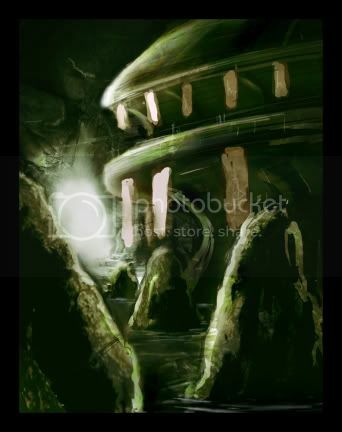 View Poll Results: Vote for your favve mystical cavern temple! 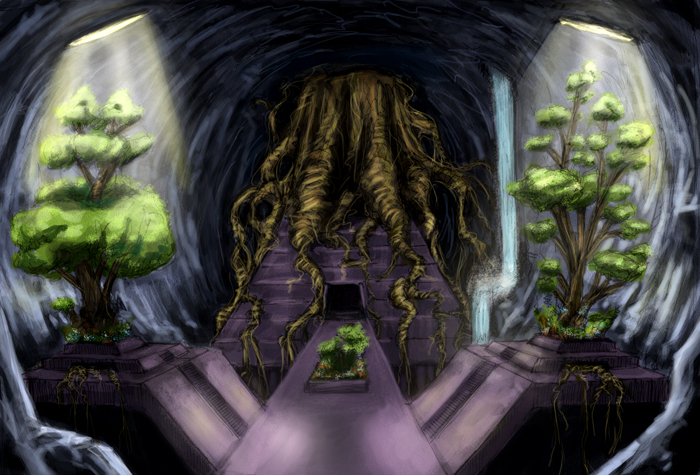 Thread: ConceptartCohesion #001: 8th Day >>> EOW - Mystical Cavern Temple ProNatura - Voting! Abuse and contempt of mother nature lead the way for ProNatura - a group of people who denounce the reprobate behaviour of VidaNova and the likes of them. This peaceful and reasonable group lives reclusively in hidden places like in huge caverns, arctic wastelands etc. The most popular base of this group is the Mystical Cavern Temple. A very huge cave with an amazingly beautiful and mystical temple built in. The temple offers unequaled opportunities and is called the 8th wonder of the world, with a certain allusion to the fateful term of the 8th day. The architecture and lighting atmosphere of this place describes the wonderful relation of the inhabitants to mother nature and their will of getting back to the roots while rejecting all kind of violence and abuse against nature. hmmmm.... this conceptart Cohesion thing has kinda shut down the weekly EOW...!!!? GREAT pic by the way, tyranx! I voted on Tyranx, his picture had such calm and serenity. It really showed the harmony between man and nature. My entry was too good? I'm confused. It was not a work in progress, though I could show them... there were 8 states before it... maybe I should post them in another thread? I shall set an example: Please, be more brutal on me though. yAdam You have a good sense of lighting, and I'm guessing this was using the Great Wall as a point of reference? The scale here is not consistent. Maybe it's just those openings that are all different scales that's distracting? Having that line come from the right hand corner is like, breaking a fundamental rule of landscape design. chaosrocks This also leads the viewer's eye off the right hand corner of the scene. Some of the lights could be linend up a little more consistently. It looks like icicles are falling down into the water. Better run to get in under that roof! Once you get there... it looks pretty vacant. Seems like there should be a kneeling throne or... something that would indicate it's purpose. Hanuka First impression: Dr. Seuss. Hehehe, not sure if that's good or bad. The black form in front is ambiguous. It's really a dark black next to the rest of the colors. It's competing for my attention. meeatu Those three rocks seem so uniform, I find it disracting to the emphasis of the scene. Breaking those up would help draw the eye of the viewer to the structure in the cave instead of a straight shot from the corner to the mouth of the cave. Tapestry banners again? Mmm, at least they're yellow/orange. Good choice. misledtomisery A pyramid theme. Cool beans. I can see how this would indicate nature right away with the trees. It's somewhat difficult to tell if the lighting is coming from the outside, from above them, or if it is artificial. A hole in the cave ceiling would have more details visible in the stone where the light pours through. The roots of all trees seem lost and unattached. Some references on something similar may help. *masque* I'm confused by the use of colors in your background. A hint of yellow/green in the background colors would make everything much more unified. The metallic entryways also apear mech & inorganic which is working against the main theme. Fortunately, those nitpicks are pushed into the background. It must be the pool and the organic shape in the middle that takes over the emphasis of the scene and conforms to the description that leads me to the conclusion that this is the best entry. Ooo, and a lengthy backstory too! Yay! You did your homework and the extra credit! Top marks! One of the most controversial structures of the modern era, the ProNatura Temple at Gaia Cavern was the embodiment of the vision of Jeremiah Whitcomb, the renegade Naturalista who discovered the Gaia Cavern in 2385 CE. A fugitive from charges of eco-terrorism, Whitcomb literally "went to ground" in the cave-riddled Kentukia region of NorAmeriko, where, according to ProNatura apocrypha, Whitcomb spent 40 days and nights wandering the absolute blackness under the earth before coming upon a faint glow, which led him to the opening into the Gaia Cavern. There Whitcomb is said to have received a revelation from Gaia herself, that this was to become the site of a great temple built in her honor. Upon his return to the surface, Whitcomb went among his fellow Naturalistas like a prophet of ancient times, evangelizing his vision, gathering a following that came to be known as the Gaia Templars. There were, however, many among the Naturalistas who felt that if the Gaia Cavern was indeed real, then construction of a temple there would be darkest blasphemy upon the true spirit of Gaia, and a perversion of the Naturalistas' guiding stricture "Go lightly upon this good Earth." This schism led to the formation of ProNatura, comprised of Whitcomb's followers, and the minority True Earth Clan, which faded completely in influence and public visibility by the turn of the century. The Gaia anthrolith is the second largest natural formation of its kind in the known solar system, surpassed in size only by the Martian Triad of Rust. Unique to the Gaia formation, however, is the colony of bioluminescent lithophores permeating the translucent onyx of the flowstone formation, and the almost perfectly circular reflecting pool the anthrolith seems to gaze toward. Given the overwhelming natural beauty of the cavern, it is understandable that Whitcomb was moved to visionary zeal, though some cynics note that the mushrooms found in the darker recesses of the cavern are known to contain certain psychogenic alkaloids, and Whitcomb had fasted for a very long time before finding the cavern. Orion9282 Looks future-tech, but I don't get the idea of water worshiping from the scene. I think the man made elements dominate over the natural elements. The composition works well and I like the lighting. It just doesn't work for the description for me. cesaraguilar What I'm seeing as doors do not seem to follow the perspective, or they are all different sizes and have little relation to each other? The circular opening is the most unnatural inorganinc shape here. The dark black of the hole holds my eye. If you croped the image about halfway up, where the first horizontal beam from the top is, that would make a better composition, I think. The other horizontals are competing for attention. Well I saw you picture Mega Data, and the main advice I would give is, to give it much more contrast, Darker shadows, this would help to define the shapes. As it is now, it looks kind of flat. I usually have the same problem with my pictures. But if you try to add some really dark shadows and bright highlights and you can really see the difference. Also kind of the same thing, but darken the bakground (or the mountain) to make the contours of the temple/mountain more clear. Maybe you have intended it to be in a mist, but still a bit darker BG would help. Don't be affraid to use a bigger variety of colors. And lastly make the picture bigger, I know that making it smaller sometimes makes it look more detailed, but paint big from the start. around 800*600 is a good sieze when finished. voted Tyranx, though like others i would prefer more "architecture" in a temple. but i appreciate subtlety, too, and the power of implied content. definitely some expert handling of the lighting, imo. Orion9282's image was also very strong, it just seems to lack somewhat in definite "cavern" references; when i first saw it it seemed the inside of a vast cathedral, the ledges and such were too indistinct to immediately set the location. beautiful forms in the architecture, though. Masque got my vote because it definitely made me "feel" cavern and definitely hit the notes for the description. I think Tryanx's design is fantastic, but doesn't emanate "cavern" because of the incorporation of the exterior element. Gorgeous rendering though. Tyranx got my vote here- beautiful piece, the lighting and detail on the walls looks fantastic. I wasn't sure that this was the image that best fitted the criteria, but it was so nicely done that I felt it deserved the vote. yAdam and masque were also two fantastic pieces. MegaData- Thank you for the helpful critique, much appreciated. yAdam, Tyranx, masque, and Orion9282, all great renderings. Orion9282, yours was a bit too futuristic and too minimalist when it came to worship of nature. Tyranx, though very detailed, the trees looked dying, and the colors gave the same feeling. Masque, you were my runner-up. The central piece of the cave was beautiful, but the rigidity of the buildings didn't really feel integrated into the rest of the enviornment. Voted for yAdam. I loved the use of the greens and purples, and the temple scaling up the side of the rocks was well integrated. The stairways still seem a little off, but the main building really pulled in my focus. Very nicely done. chaosrocks - The white Stalactites would be the icicles but the Stalagmites in the water of the blurry variety are the main instigators of creating a sense of movement. If you are using those terms, Stalactites & Stalagmites, limestone or iron ore hues would be more suited to the environment. They are rarely ever a solid blue or white, unless it is ice. Lingmerth - I did work at twice the size of what was presented, more or less. It actually changed dimensions several times. I rarely ever post images at full size on the web but I could've still reduced it to the size you've indicated. I just figured half the resolution would prevent side scrolling. I was going for a monochromatic theme, because I was attempting an arctic scene. Any suggestions on other colors for variety, yet understated? I did feel it was getting too dark in a previous version, so I may have over highlighted the dark areas. It was a sort of free form thing that didn't really take shape until the last two states. Thank you very much for the crit. That gives me something to push it further. megadata- i appreciate the comments. I hate the blurriness too. calcite deposits can be pretty white, but I surely see what you are saying. I wish they had brought yours to poll, It is lively and full of movemant. I wish it had more value contrast. all the colors seem to be the same value. Im always glad when mine makes the poll. I don't really know why yours wasn't you had a good idea. to turn it inside out Im always a little diffident at this poin tin the game. I voted for Tyranx, I love those rocks. Would be nice to know why mine didn't make it to poll. Anyone? The colours reenforce the natural feel and flow of the idea. The architecture is, while intrusive (the steps cut into the rock), it is also not dominating the natural architecture of the stalagmites/tites. Then there is the melding of human and natural architecture within the sculpture of the woman at the center of the piece bringing both human (in the form of the mother figure, one of the earliest artistic creations ever found being such sculptures of female figures) and nature together. Tyranx - My god, that's an awesome painting. Wondering, do you do concept art professionally? If not, quit your day job! I think someone asked if you could post a tutorial, step by step, or anything to give us a clue as to your process? Of course you got my vote. Though I agree with everyone in saying that they'd like more architecture in the piece, I thought that since these people were in opposition to VidaNova, maybe in your view, they didn't have the money to build such great architecture. Also, I wish yours had more of the "8th wonder of the world" to it. Still, this painting amazed me. And Masque... excellent as well. I love the subtle scale reference, I think it really has that "8th wonder" element to it. Of course, you were my runner up. And thanks to those for the crits on my piece... I totally agree with what everyone's saying. I was going to try and put more nature in the image... but I ran out of time! Pootle I think they goofed. Your text starts off saying "Hope it's okay to post a WIP for now" ...and if they did not read the text right before the image as, "Update (final):" then that would be a reason not to go to poll... but that's the only reason I can guess. *shrug* If you want a critique, I can find some time later. chaosrocks It was a good foundation. Even in keeping the white, they could just be a little more defined. The icicle thing was my first impression. It's not necessarily how others see it. Thanks Orion9282, No unfortunately I don't do it professionally yet, but I'm currently building up my portfolio so that one day I might. As for a tutorial, I'll save my step by step process for the next environment that I do, so you guys can see my workflow. Thanks again for the votes guys, lookin forward to the next environment! masque: gorgeous entry but I went with Tyranx in the end. yadam, orion: great stuff as well! I want my weekly EOW back! if rook is not handling the EOW any more, you should have asked me to step back in. Im free at the moment and can take over with some fresh topics. definitely want to thank all the peeps who graced my effort with their kind comments and votes. very encouraging, and very much appreciated. Tyranx, you're damn good, y'know that, don'tcha? fine enviro, 'grats on topping the poll. Thx man, right back at ya. ConceptartCohesion #001: 8th Day >>> EOW VidaNova Corporation - Voting!